Peacekeepers with the United Nations Mission in Liberia (UNMIL) on patrol. Adopting a resolution today, the United Nations Security Council decided to extend the mandate of the United Nations Mission in Liberia (UNMIL), for the final time, until 30 March 2018 and adjusted its mandate to comprise protection of civilians, reform of justice and security institutions, protection and promotion of human rights, public information activities, and protection of UN personnel and installations. In the resolution, adopted by a vote of 12 in favour, with three abstentions (France, Russia and the UK), the Council noted the potential security challenges during preparation for and in the period leading to presidential and legislative elections in October 2017, stressed the need for the Liberian Government to prepare for the elections, and called on all parties to ensure that the electoral process is free, fair, peaceful and transparent. It also decided to reduce UNMIL’s 1,240 military personnel to a ceiling of 434, and its police strength to 310 personnel. 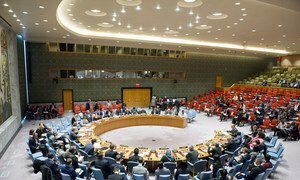 In the resolution, the Security Council also underlined the need to address sexual and gender-based violence in the west African country and to fight against impunity for such crimes. The Council further emphasized the importance of the role of women in preventing and resolving conflicts, as recognized in its resolution 1325 (2000). UNMIL was established in Liberia in October 2003 with an initial troop strength of up to 15,000, including 250 military observers, 160 staff officers, up to 875 UN police officers and additional five armed formed units each comprising 120 officers, and along with a civilian component and necessary support staff. Briefing the Security Council on the situation in Liberia, the United Nations peacekeeping chief today underlined that the country remained stable and that since the security transition in June this year, there had been no incident serious enough to warrant an armed response from the UN mission in the country, known as UNMIL.